Designed by C.G. 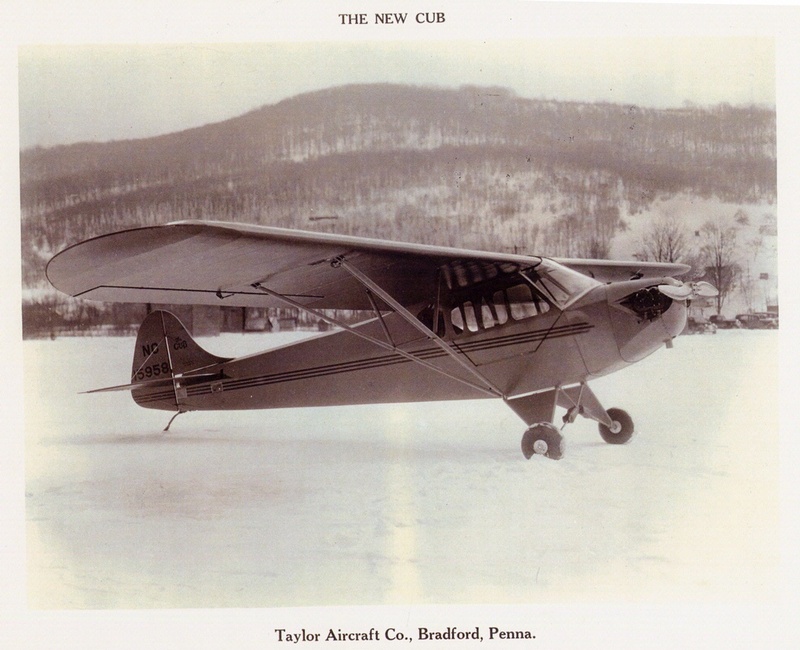 Taylor and made possible by the financial support and marketing genius of William Piper, the Cub helped make flying popular and affordable for thousands of private pilots. The tandem two-place J-2 is the transition model of stable and economical Cub light aircraft that made flying easy to learn and afford. The J-2 cost $1,470 or could be rented for $10 an hour. A total of 1,207 Taylor and Piper J-2 Cubs were built from 1935 to 1938. 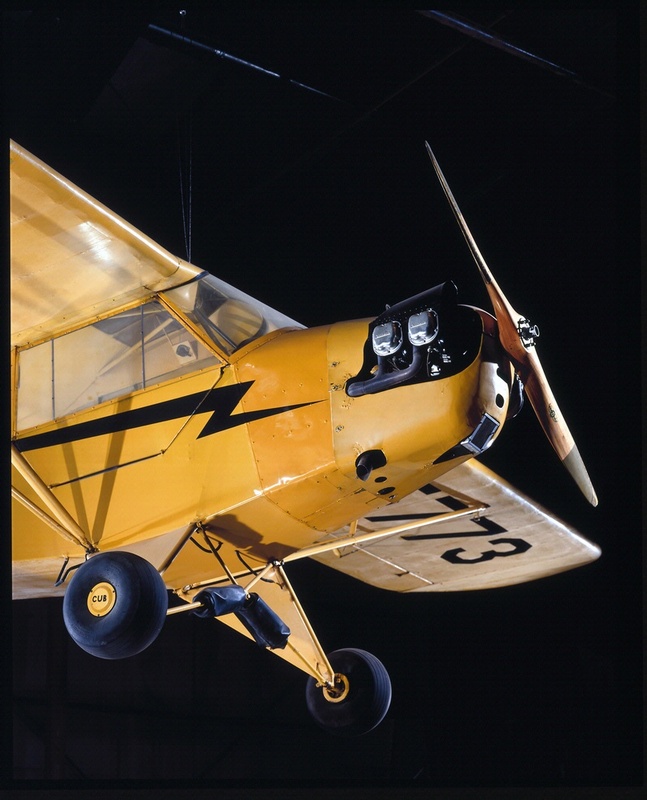 William Piper and the Piper Aircraft Corporation board of directors anointed this Cub, completed on November 2, 1937, as the first official Piper J-2 and flew it as the company plane until April 1939. This Cub had a succession of owners. 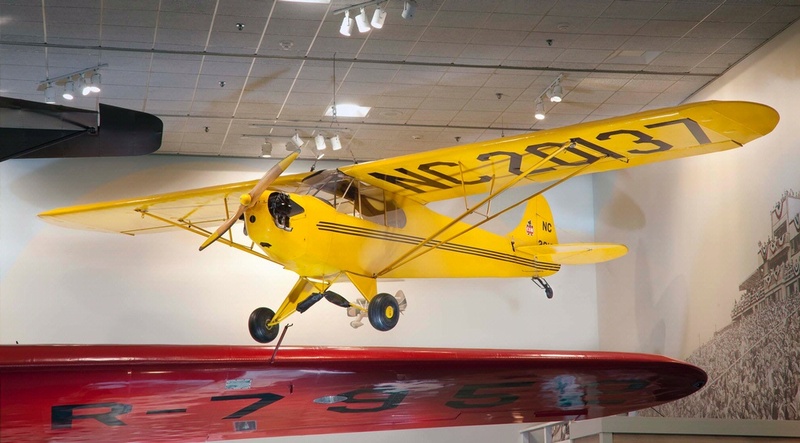 It was restored by Hal Goff of Aero Enterprises of Pittsburgh in 1976, then flown to Lock Haven where former Piper Cub engineer Walter Jamoneau piloted it. Lefferts Mabie Jr. of Pensacola, Florida, acquired it in 1981 and donated it to the Museum in 1984. 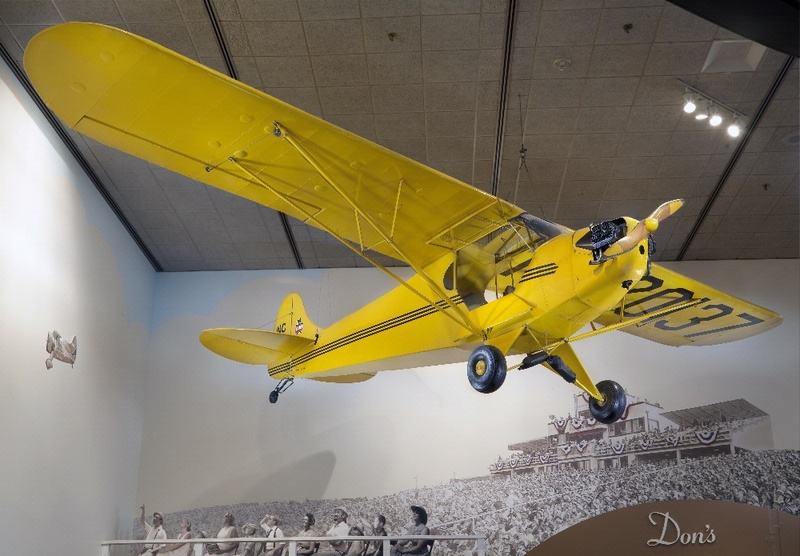 “Piper Cub” brings to mind a little yellow airplane, with a bear cub image on its tail, landing on a grass field. 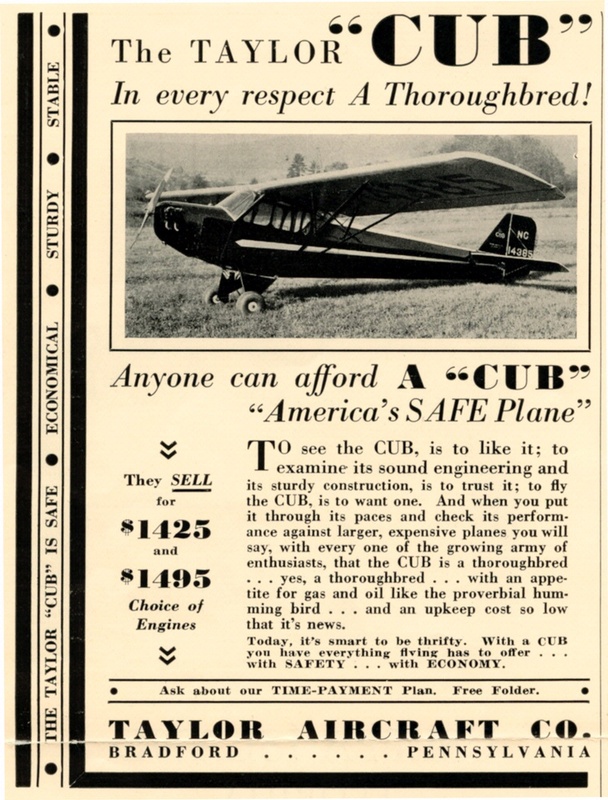 The Cub was a simple, inexpensive light plane with gentle flying features that captured—even helped create—the private pilot market. 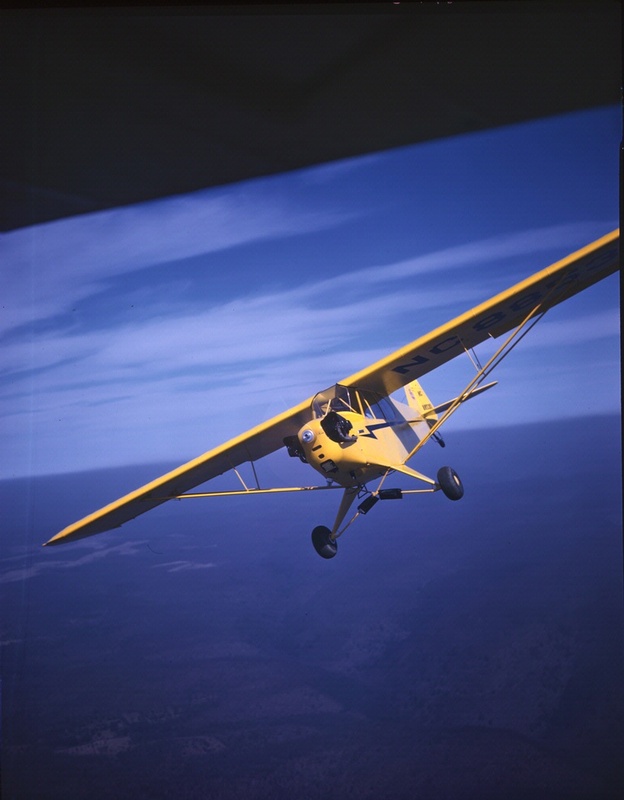 Since 1931 thousands of pilots have learned to fly in Cubs. 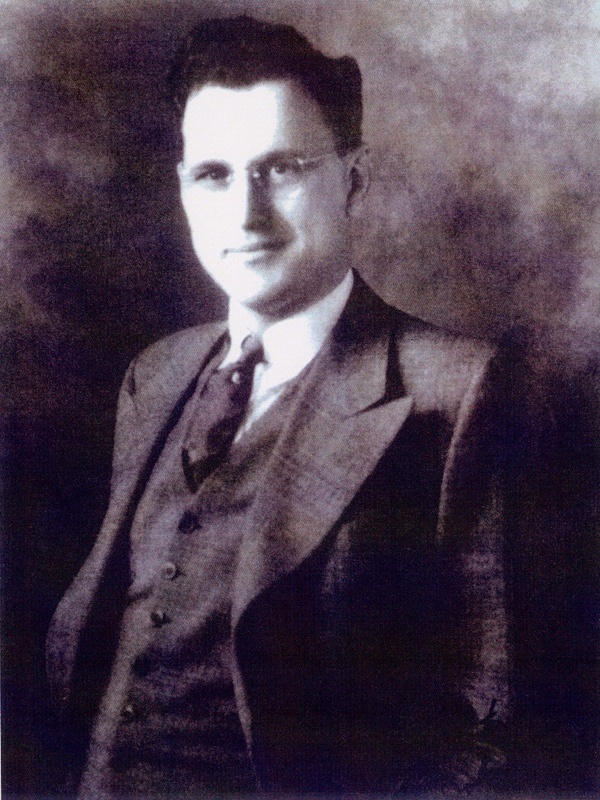 Two men were responsible for the Cub’s success: C. G. Taylor designed it, and William Piper provided financial and marketing genius. By 1941 a third of all general aviation aircraft were Taylor or Piper Cubs. More than 27,000 had been sold when production ended in 1947. Thus, Cub became a generic term for all light airplanes, and from it came the line of Piper personal and business aircraft that continues today. A light plane needed a light engine. Using his D-1 Glider’s high wings, Taylor built a tandem-seat fuselage and installed a 20-horsepower Brownback Tiger Kitten engine, but it was so weak the plane barely left the ground. 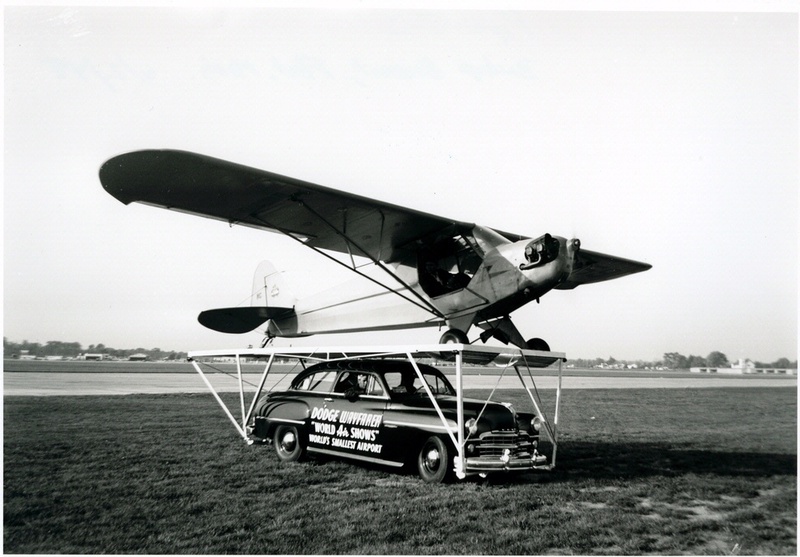 Employee Ted Weld observed that an airplane with a Kitten engine should be called a “cub.” The search for a better engine continued, but the Cub had arrived. 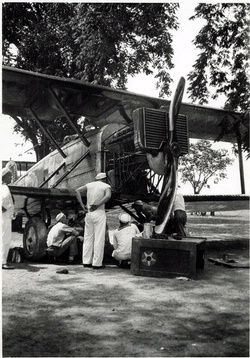 The E-2 Cub was certified in 1931 with a 37-horsepower Continental A40-2 engine. 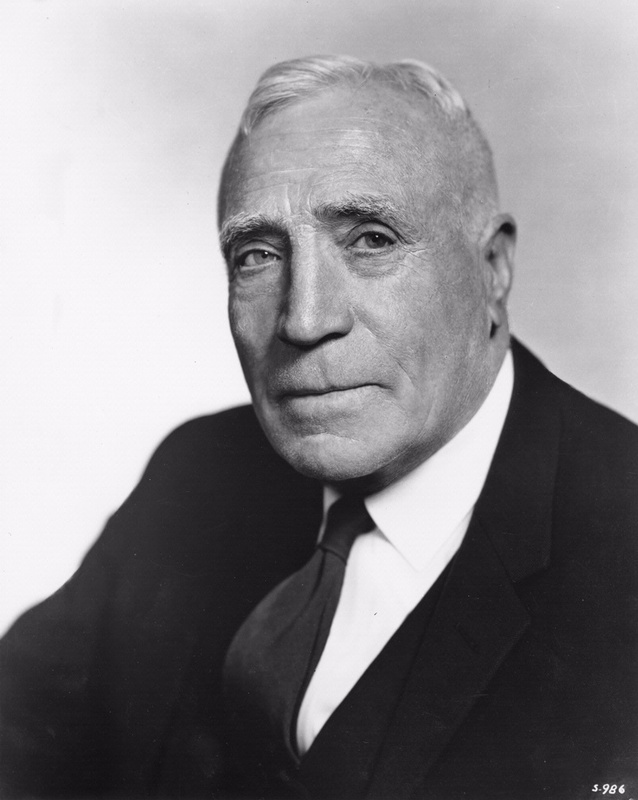 The Taylor-Piper partnership broke down, and Piper bought out Taylor, who went on to build Taylorcraft airplanes. Then on the night of March 16, 1937, Piper’s factory burned to the ground. Piper searched for a new home and found an abandoned silk factory in Lock Haven, Pennsylvania. 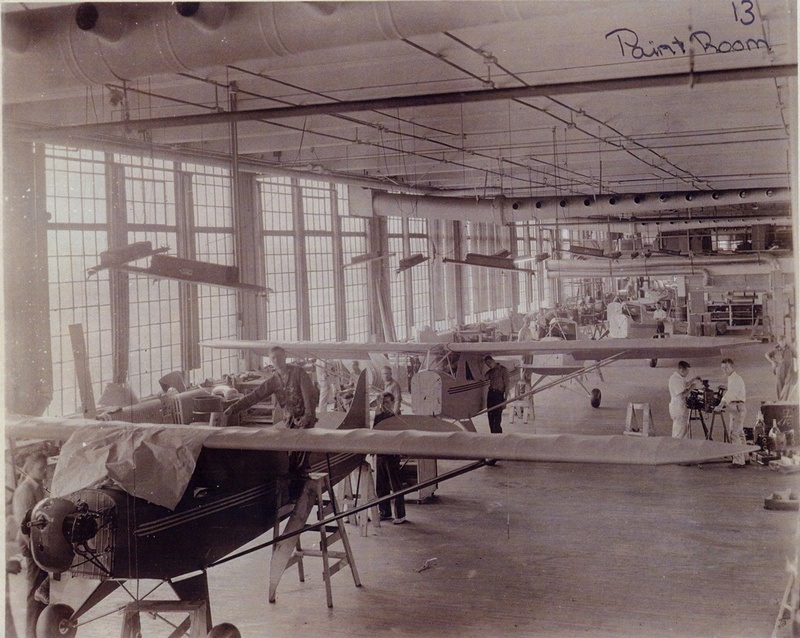 The large, modern factory provided Piper with huge growth potential. Production resumed in July 1937 with jigs and tools saved from the fire. In November Piper changed his company’s name from Taylor Aircraft to Piper Aircraft Corporation. 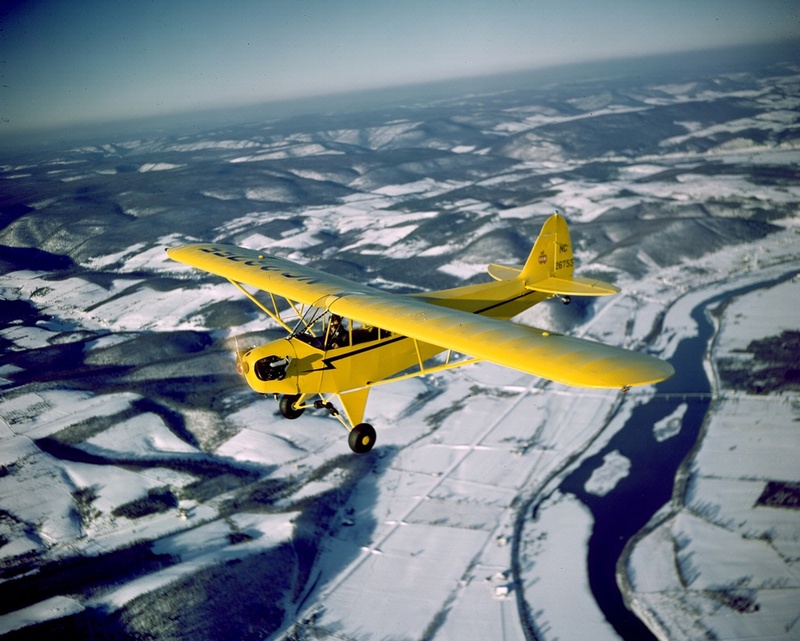 The Cub’s tandem design, similar to that of military training aircraft, gave it an edge over Taylorcraft and Aeronca for government contracts. The military accepted it as the L-4 in 1942, and Cubs flew throughout World War II as liaison, observation, and ambulance airplanes. 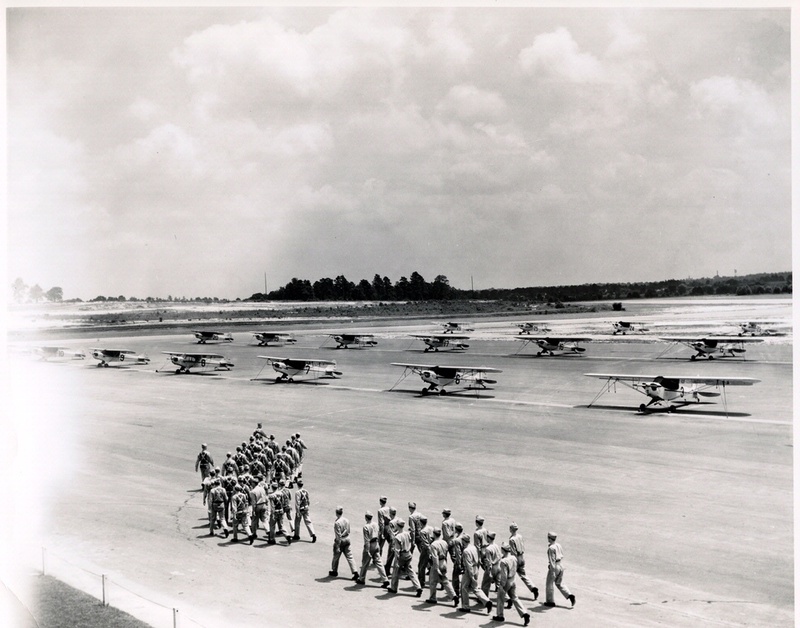 Over 5,600 military Cubs, also known as Grasshoppers, were built. At their wartime peak, a new one emerged from the factory every 20 minutes and they were even used during the invasions of North Africa, Italy, and southern France. The small Piper Cub used very little runway for takeoff. The plane would literally “hop” into the air like an insect. So, it was nicknamed the Grasshopper.